This baseball-sized owl is another of pacific slope endemics. Related to the wide-ranging ferruginous pygmy-owl [G. brasilianum], this species can be found only in Mexican west coast from Sonora to Oaxaca. Unlike many owls, pygmy owls are diurnal – they are most active during the day, when they also hunt, their prey are mostly birds – up to the size of robin, but reptiles and insects are frequently taken. 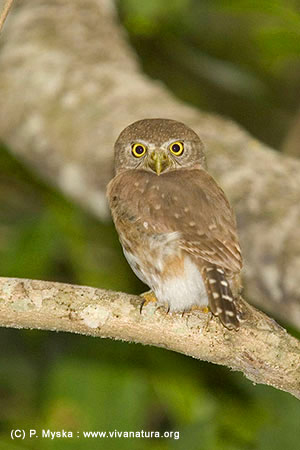 The overall color of this species is brownish, head is rather spotted than streaked, which together with only 3-4 visible white tail bars, distinguishes colima from ferruginous pygmy owl. Both species, just like all members of the genus Glaucidium posses black triangular patches on the hindneck resembling a pair of large eyes. Some studies indicate that this unique coloration pattern plays a role in diminishing avian mobbing against the pygmy owls. The attacking birds are possibly discouraged by the sight of these two “huge eyes” staring at them, not realizing that at that precise moment the owl is actually facing exactly the opposite way. In our bay species can be found especially in the tropical forest, but reports from greener suburbs are also frequent. Colima pygmy owls nest in tree cavities and typically lay 2 – 4 eggs.